Dr. James Edward Bryant, Edgecombe County native, graduated from North Carolina A&T in 1951. He obtained his medical degree from Howard University in 1960 and practiced medicine for 40 years, during which time he served thousands of patients. 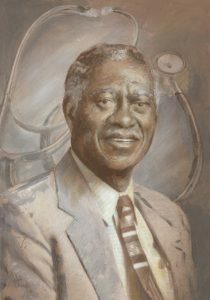 Dr. Bryant was the first African American physician to have hospital privileges at Park View and Nash General Hospitals. He was an active member of several medical associations and served in the Rocky Mount chapter of the NAACP, the Rocky Mount Chamber of Commerce and his college alumni associations. He was a lifetime member of Alpha Phi Alpha Fraternity, a charter member of the Epsilon Sigma Chapter and Chairman of Mount Zion First Baptist Church Board of Trustees for 18 years. Dr. Bryant died in 2001.